Appsfire was already one of the top tools for discovering apps and finding app deals. But now, Appsfire is combining its Appsfire and Appsfire Deals into one app that it hopes will be an even better destination for app lovers. Appsfire 4.0, which is debuting Monday on iOS (s aapl), has been rebuilt to speed up the app finding experience and make its recommendations more relevant. It should give iOS users a solid alternative to the newly upgraded Apple App Store. As my colleague Erica Ogg pointed out, the App Store, remodeled after Apple’s acquisition of app search tool Chomp, still needs improvements in several areas including search relevancy. Appsfire 4.0 allows people to get fast search results for an app name, developer, category or a need. I tried it out and found it seems a step smarter than the App Store in figuring out what I’m actually looking for. The App Store has gotten better at what a user is trying to search for but still looks more at downloads so it can struggle with all the different kinds of searches that people undertake. The Appsfire recommendation engine is also more attuned to an individual user thanks to updated preference settings. Now, users can set their price sensitivity, their interest in games, and how much deals matter to them. That’s in addition to more general profiles like geek, parent, gamer or traveler that they can set for themselves. Appsfire’s recommendations work with Appsfire’s App Scores, which it developed as an alternative to Apple’s App Store rankings. Unlike the App Store rankings, which are largely tied to downloads, Appsfire uses app ratings, developer reputation, and web mentions and reviews to come up with its own score. Now, Appsfire bases its recommendation on what it thinks is best for a user, not just which apps are on sale, which is what it did in the Appsfire Deals app. The Appsfire experience is more social as well. 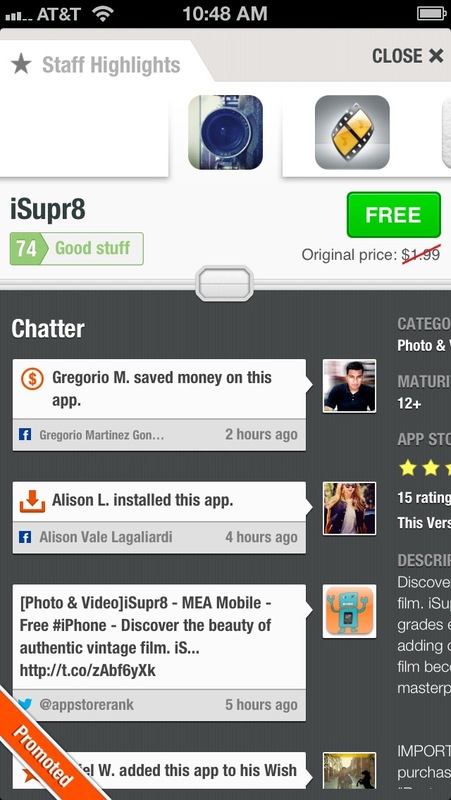 Inside the app pages, Appsfire pulls in prominent Twitter and Facebook (s fb) comments in a feature called Chatter. Users can create their own curated lists of apps, which can be shared and will eventually feed back into the recommendation engine. Appsfire users can also connect via Facebook to see what their friends have saved and downloaded. Ouriel Ohayon, founder of Appsfire, told me the decision to collapse Appsfire’s two apps into one was largely practical because it’s hard to manage and market two apps. But it also means that users can get everything they need from one app, which can now address not just sales shoppers but users just looking for the best app for them.